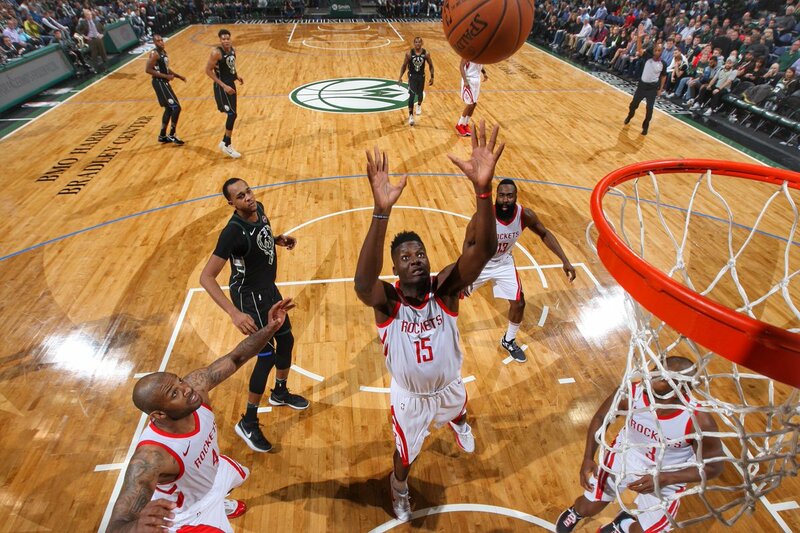 The Houston Rockets had no particular interest in losing to the Milwaukee Bucks on a Wednesday night. In retrospect, that seems like a good decision, since it ticks their win streak up to 17 and brings them a little closer to a 1st seed in the Western Conference. It was a grueling, sloppy affair, but it was a win nonetheless. The Rockets, fresh off a win over the Oklahoma City Thunder, came into the game weary and sluggish, and more importantly unable to hit threes. The Bucks kept it close until Eric Gordon and PJ Tucker found their shots, with the lead ballooning to as much as 18 on the way to this win. The Rockets ended the night with 35% shooting on three pointers, including 4-8 for Gordon and 3-3 from Tucker. Gordon in particular opened up the floodgates right when it was needed most, after the Bucks had shaved 12 points from a 16 point lead in a matter of minutes in the third quarter. A close game could have been a disaster for the Rockets, since in the waning minutes, they let a double-digit lead dwindle down to just a few points, largely through sloppy play and tired legs. Whether the slump was indicative of a larger issue, of exhaustion, or just intermittent difficulty isn't really answerable in just one game. What we do know is that Chris Paul ended a minutes-long field goal drought with an isolation when it was needed most, and the Bucks seemed too discombobulated to mount any real resistance after that. The offense in general looked a little slow, and the only reason the score hit 110 is because the Bucks began fouling intentionally down the stretch. The Rockets were happy to drag out the last minutes of the game and push the variance down, and would have kept doing so if not for the Bucks fouling. Tonight may not have been his best night offensively (26 points, 6 assists), but Harden brought some extra oomph on defense. He not only logged 4 critical steals, he also had a defense rating of 95.5, which is astonishing for him. He had the best defensive rating of the team, and while likely mostly noise or a result of him playing alongside excellent defenders, it's also partly reflective of a recent uptick in his defensive effort, something Houston will need in the playoffs. The Rockets have made getting to a ridiculous 17 wins in a row look positively pedestrian, somehow, including this win against the Bucks which never really looked in question. One of their tougher tests on the season will come on Friday against the Toronto Raptors, one of the few teams in the league that have shown themselves to be in Houston's tier. They have another chance to increase their streak, and another chance to move one step closer to the 1 seed.